During the Presidency of the European Union last year, agreement on a European Youth Guarantee was reached and was much promoted, by Labour MEP Emer Costello for example, as guaranteeing “young people a quality offer of employment, education, an apprenticeship or a traineeship, within four months on becoming unemployed or leaving full-time education.” Now that rhetoric has to be backed up by some details, contained in the government’s implementation plan, it has become entirely clear that all we have here is an empty promise, together with the threat to cut dole for those who refuse to go on free labour schemes. The purpose of the ‘Youth Guarantee’ is really to allow the Labour Party and the other establishment parties in Europe to pretend they are doing something about this crisis of youth unemployment. But underneath the nice name, what is there? No guarantee at all and a continuation of forced emigration and worsening wages and conditions. The Irish government is promising a ‘Youth Guarantee offer’ within four months to those with most need and for nine months for those with less need. This is already a betrayal of the promise of an offer within four months for all. What’s more, it is to be ‘progressively’ rolled out and will only be fully ready by the end of 2015. The real kicker is the definition of a ‘Youth Guarantee offer’. In other countries where this has been introduced, young people thought that they had a guarantee of work or training in an industry which they were interested in. This wasn’t the case. In Denmark, they actually dropped the use of the word guarantee from their youth scheme because of the expectations it carried and the subsequent disappointment and disillusionment with it from young people. In Finland for example, large numbers of young people who had no interest in cutting down trees were pushed into the forestry industry. This was often for major multinationals with no wages or a JobBridge type payment. Rather than being given a start in your career of choice, it just means any offer at all – mean training or ‘work experience’ in whatever industry has a gap. It will mean someone who wants to work as an artist ending up as a JobBridge intern as a ‘sandwich artist’ in Subway. A primary reason for the empty nature of this guarantee is that it is massively underfunded. The EU has agreed to spend €6 billion. Yet, the International Labour Organisation estimates that to implement a programme that offered young people a real guarantee would cost €21 billion. Despite posing as champions of the youth guarantee, Labour MEPs along with all other southern Irish MEPs apart from myself, voted against an amendment to increase the Youth Guarantee funding to that level. In Ireland in the last budget, the government committed €14 million to the guarantee, at the same time as cutting €35 million directly from young people, through dole cuts and apprenticeship fees! Including EU funding, the government plans to spend €46 million implementing the Youth Guarantee in 2014. This falls massively short of the €273 million estimated by the National Youth Council of Ireland as necessary. This also does not take into account the resources which would have to be put into staffing the guarantee. Indeed, in the government’s document, references are made to the ‘scarce resources’ which are already struggling to cope with the unemployment crisis. For the guarantee to work, young people will need a case worker to put time and effort into assessing their education, skills and career ambitions. Experiences from Finland and Sweden show that if each case worker is overloaded with hundreds or thousands of cases, then the individual specialisation which is required will not be met, and instead a conveyor belt of box ticking will take its place. The Youth Guarantee adds nothing to help young people get off the dole. 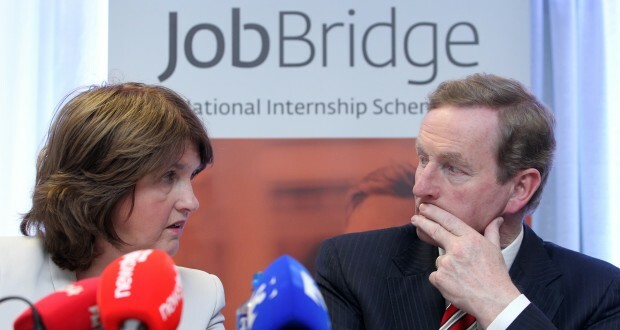 Instead, it brings in measures which make it compulsory to engage with slave labour schemes like JobBridge under the threat of having welfare payments reduced. This could see a young person, already trying to survive on a measly €100 a week, being cut to €75. For those receiving €144 per week they will be reduced to €111. The government’s real guarantee is this – take part in these free labour schemes or they will drive you into poverty or to the airport. 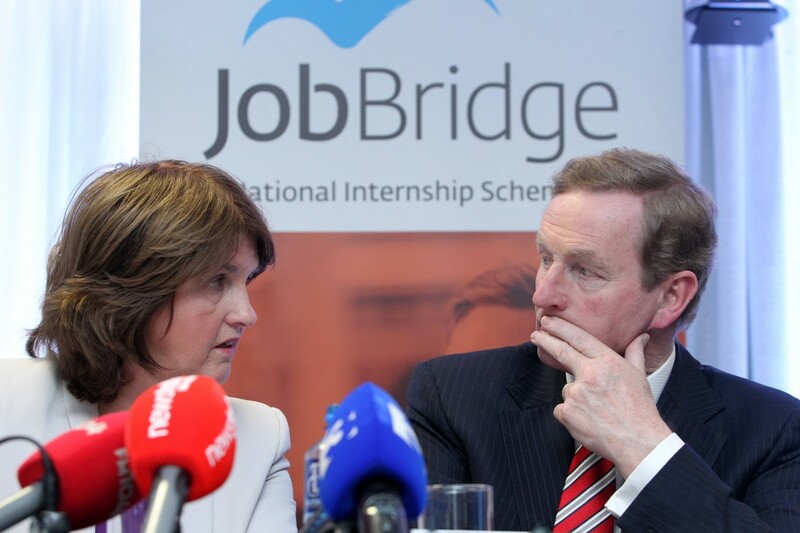 The Youth Guarantee cements free-labour schemes like JobBridge, TUS and Gateway at the heart of the government’s ‘solution’ to unemployment. This is the ushering in of an Irish version of the despised WorkFare scheme which has operated in the UK. The compulsory nature of the Youth Guarantee will no doubt be accompanied by the usual propaganda about the unemployed, specifically unemployed young people, that they sit at home in front of plasma screen TVs and need to be ‘incentivised’. Parallel to the ‘Youth Guarantee’ is the privatisation of the welfare system. G4S are currently tendering for the outsourcing of the contracts at a local level. This will see private companies tender for the right to implement aspects of the unemployment service. They will be paid on a results based basis – the more people they can put off the dole the more they get paid. This gives an incentive to them to get young people off the dole by whatever means necessary, without reference to the needs of the unemployed. Together with the new compulsory aspects introduced in the Youth Guarantee, this means a bounty has now been placed on the heads of the unemployed. Far from being something which young people should welcome, the Youth Guarantee is an escalation of the government’s war on young people. It is a continuation of the government’s real response to unemployment, which is two-pronged. The first is a policy of forced emigration. This has been pursued through slashing the dole for young people, hiking college and apprenticeship fees and engaging in a vicious propaganda campaign to portray youth unemployment as a lifestyle choice. The result is that 177,000 people aged 15-24 have left in the past five years. The second is using the existence of mass unemployment to try to drive down wages and conditions further in the hope of becoming more ‘competitive’ and increasing exports. So far, while profits are up over 50 per cent since 2008, unit labour costs are down 12 per cent since 2008. A real guarantee is needed for young unemployed people instead of free labour schemes. That can only be done with investment in education, meaningful training and the creation of jobs. 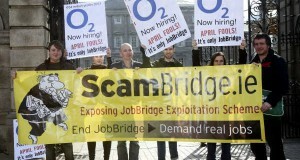 The ScamBridge.ie campaign against JobBridge, which I initiated, will shortly be launching a RealJobs programme to detail how this could be done.